I so enjoyed this story. 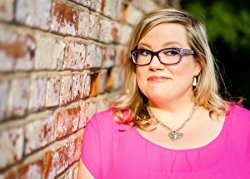 Libby Klein writes the character of Poppy with wonderfully warm, funny, and charming characteristics. 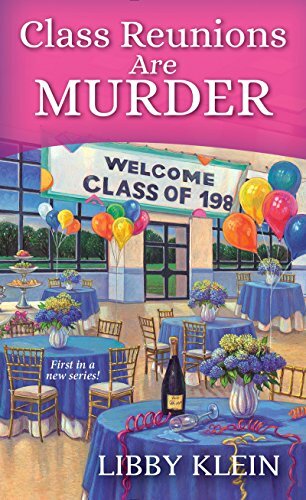 To say that Class Reunions Are Murder is a great cozy mystery really doesn’t do it justice, for this story is refreshingly different and stands out in its genre. The way the author describes things that many people go through like the weight issue really makes this book relate-able to many people. I think this is part of what makes this such a good book. Amazing start to a brand new series. . . I was unable to put down I was laughing so hard. It was absolutely wonderful and I consider it a must-read for fans of the genre. Several interwoven storylines add depth to the main characters, and Poppy’s attempts at self-improvement give Class Reunions Are Murder plenty of laugh out loud dialog and scenes. This, the first book in the Poppy McAllister series, was a five star read for me. Maybe even 6. . . A well-thought-out mystery to top it all off kept me engrossed enough to finish this book in a single sitting. I was totally shocked by the ending which is what I like in a cozy, to be left guessing till the very end. WOW, this book was awesome! Really, well done Libby Klein, on writing an outstanding book right out of the gate and knocking it out of the park with the first book in a new series! Oh my gosh…I loved this book…LOVED IT! Poppy is the cozy mystery character I’ve been waiting for. She is smart and so funny. This book had the feel of chick lit meets cozy mystery. It’s funny, heartwarming, romantic and mysterious. All blended together in one exciting story. Can’t wait to have the chance to read “Class Reunions Are Murder”. Thank for the book tour and the chance to win a print copy of the book! Love the cover! Can’ wait to read this one! Loving all the great comments and information on the book tour for “Class Reunions Are Murder”! Class Reunions Are Murder sounds like so much fun — I can’t wait to read it. Can’t say the same about my upcoming class reunion this year! I do enjoy stories with an older protagonist. Love the cover. Sounds very interesting. I am really happy that I found this page. I have found some really good reviews here….and some great contests to win some of the wonderful books that I have seen reviewed. Thanks for all of this awesome information. I am so happy you are here! !